In a statement, South Africa said it told U.S. Charge d’Affaires Jessye Lapenn it was “disappointed” over the failure to use available diplomatic channels. The country is in the middle of a racially charged debate over land reform, a lawful process that seeks to correct the legacy of decades of white-minority rule that stripped blacks of their land. Nearly a quarter-century after the end of apartheid, white South Africans, who comprise about 8 percent of the population, own more than 70 percent of the private agricultural land. In July, President Cyril Ramaphosa said the ruling African National Congress party would amend the constitution so the state could start to expropriate land without compensation to speed up the process of land redistribution, but that has not yet happened and no land has been seized. A fringe group of the white minority claims land reform will inspire violent attacks, though experts say farm attacks reflect the country’s generally high crime rate and are on the decline. 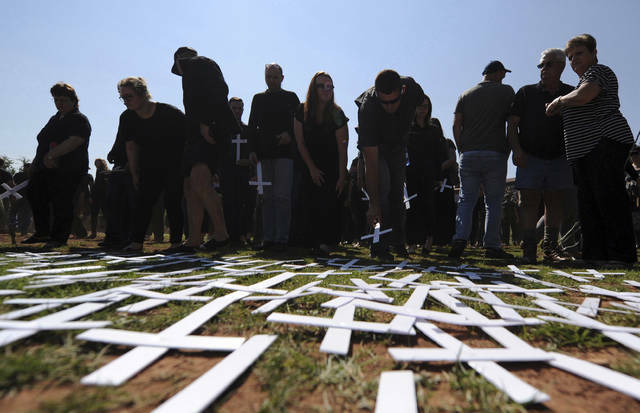 Claims of “genocide” against white South Africans, however, have been picked up by some white nationalists in the U.S., and leaders of a right-wing South African group traveled to the U.S. in May to lobby officials about the alleged targeting of white farmers. Trump’s tweet early Thursday followed a Fox News segment claiming South Africa had started seizing white-owned farms. The tweet was quickly lambasted by many in South Africa, with one top ruling party official, Zizi Kodwa, telling the Associated Press that Trump has never experienced apartheid and doesn’t know its legacy of stark inequality. Nauert toned down Trump’s language suggesting that massive land seizures were underway and did not repeat the president’s suggestion that large numbers of white South African farmers had been killed. Trump’s tweet did find support among some South Africans, while some farmers spoke out about their security concerns. “We try very hard not to go and live in a walled security area somewhere, but it costs a lot of money in the first place to have the necessary security,” said Leon Sholtz, a farmer in Broederstroom in North West province. Each time I go to Hazleton, Pennsylvania, I walk away thinking of it as a place of renewal and hope, a city that is slowly fusing its past and present into a new identity that will set it apart from other cities in the region and give it a platform for the future. But it wasn’t always that way. When I started visiting Hazleton over eight years ago as part of a book project, I saw it as a place of division and dissonance. The city had leapt onto the frontlines of the national immigration debate in 2006 by passing local ordinances that required employers to check the immigration status of new employees and landlords of potential renters. Protests erupted for and against immigration, and the national media covered them closely. Finally, the courts struck down the ordinances and ruled that the city had overstepped its authority in passing local immigration enforcement legislation. Since then, Hazleton has been coming to terms with immigration in less public, often challenging, ways. Between 1990 and today, it has gone from a city that was overwhelmingly white and native-born to a city that is roughly half-Latino, with numerous immigrant families. The overall outcome has been positive for the city, which is living through an economic revival. But native-born residents and newcomers have had to negotiate a difficult pathway to begin to imagine a shared future. Like many smaller cities, Hazleton was built on immigration a century ago. Native-born Hazletonians still speak about their European immigrant roots as though their families’ arrival happened yesterday. Their town also once was a relatively prosperous coal mining town and a significant regional center. But starting in the 1950s, the coal mines’ slow decline undermined Hazleton’s place in the world. An exodus of younger residents to larger cities continued at least through the 1990s. By the late 1990s, though, Hazleton had started to attract new factory and warehouse jobs. They were supposed to keep the next generation at home, but they also attracted Mexican and Dominican immigrants from the New York City area. Hazleton suddenly added new cultural layers to its immigrant past. The tensions were visible quickly. Schools struggled to deal with parents and some children who spoke little English. Neighbors clashed over different norms about when and how loud to play music and how many people could live in a home. A 2006 killing of a native-born resident by two Dominican immigrants set off demands by the mayor to ban unauthorized immigrants. And in 2008, a group of white teenagers beat a young Mexican immigrant to death in the next-door town of Shenandoah while shouting ethnic insults at him. More even than strains on public services or differing community norms, these killings marred the relationship between newcomers and native-born residents. Then something remarkable, yet also surprisingly common, started to happen. As immigrants moved in, Hazleton started to grow again. Not just in population, but economically. Small businesses sprung up throughout the city. The old downtown started to come back. Traditional Hazleton families still run the city’s largest enterprises, but the small businesses that now dominate the city’s principal commercial corridors almost all have Spanish-language names. In five years, there were 60 new businesses, including a high-tech company started by a Mexican entrepreneur and his dual-citizen son. This is not surprising since studies show immigrants are nearly twice as likely as native-born Americans to start a business. Not everyone is happy, but it’s not hard to feel the momentum shifting. Latino residents exude an optimism about their newfound city that must rival that once felt by Irish, Italian and Eastern European immigrants. The Latino residents remember their rocky welcome from a few years back, but they express a pride in their adopted city that rivals that of native-born residents. And increasingly, many native-born residents are finding new optimism. Some of what changed is simply time. Studies show that actual contact with immigrants helps people develop more positive attitudes toward them, and that immigrants integrate better when they are immersed in the same institutions as the host community. At the same time, intentional efforts to bridge the divides have helped to knit these two groups together. For example, the Hazleton Integration Project started by the city’s most famous resident, Chicago Cubs Manager Joe Maddon, has played a dynamic role in building bridges. The divides may remain, perhaps for another generation. But the inertia seems to be firmly on the side of a future that embraces the city’s old and new immigrant cultures, along with its strategic location and entrepreneurial energy. Over time, I suspect that Hazleton will no longer be known as a political bellwether but rather as a symbol of what cities can do to renew their energies and create an inclusive identity even amid rapid demographic change. Andrew Selee, president of the Migration Policy Institute, is author of “Vanishing Frontiers: The Forces Driving Mexico and the United States Together.” He originally wrote this essay for “The Catalyst: A Journal of Ideas from the Bush Institute.” This is distributed by InsideSources.com. The Trump White House aggravated a problem with its decision to separate immigrant children from their parents at the border. It added to the number of unaccompanied minors in the country, the cases now totaling more than 80,000. This is a population the federal government has let slip from needed oversight, failing to track adequately the whereabouts of children, leaving many vulnerable to human trafficking and other abuses. The deepening problem gained attention last week at a hearing of the Senate permanent subcommittee on investigations, chaired by U.S. Sen. Rob Portman. The Ohio Republican led the way in sharply questioning officials from the departments of Health and Human Services, Homeland Security and Justice. Adding context was a subcommittee report, released on the eve of the hearing, showing how little progress officials have made since Portman and colleagues, Democrats and Republicans, urged the government to elevate its game two years ago. So the concern didn’t start with the current administration. It goes back to earlier presidencies. In 2012, the Obama years, the country saw a surge in unaccompanied children arriving at the border, fleeing violence and poverty, largely in Guatemala, Honduras and El Salvador. The responsibility falls on Health and Human Services to see that the children are placed with sponsors as they await action on their cases. What troubles the subcommittee is the lack of follow-up by the department to check on the sponsors and the well-being of the children. Portman points to an Ohio example of things going bad. Health and Human Services placed eight Guatemalan teenagers with human traffickers. The teens landed in forced labor at an egg farm in Marion. The subcommittee had urged the department to apply improved oversight of sponsors. Officials did make 7,600 telephone calls last year to check on the status of children. They learned 28 had “run away.” They could not determine the location of another 1,475. The subcommittee report also found that roughly half of the children do not appear for their immigration hearings. Which goes to the dismaying failure at the core mission. The department has argued that responsibility for the children somehow transfers to local authorities. Yet, as the subcommittee report notes, the department usually does not inform local officials about the presence of the children. No doubt, the absence of comprehensive immigration reform complicates the task. At the same time, as Portman indicated at the hearing, this is a problem that can be solved by clarifying lines of authority and making available adequate resources. As many as 8,000 cases have been pending for three years. Does that call for more immigration judges to expedite the hearing process? Anne C. Bailey does not work for, consult, own shares in or receive funding from any company or organization that would benefit from this article, and has disclosed no relevant affiliations beyond their academic appointment. When protesters tore down the “Silent Sam” Confederate statue at the University of North Carolina Chapel Hill on Aug. 20, it wasn’t just destruction of state property – a crime for which the protesters are now being investigated. Rather, the protesters knocked a powerful symbol of white supremacy from its pedestal – both literally and figuratively. Silent Sam, after all, was meant to pay tribute to those who wanted to maintain slavery. With the backing of the state, Silent Sam has stood proudly and defiantly at UNC Chapel Hill since 1913. Now the statue has become one of many in dozens of cities and municipalities where monuments of Confederate soldiers and generals have been removed – mostly with official sanction. While the removal of Silent Sam was a joyous moment for protesters who had long requested that the university acknowledge that the statue was a divisive symbol of white supremacy – for the opposing side, it was an example of what they call the intolerance of the left, particularly among those who oppose the views and policies of President Trump. Beginning first in Virginia in 1662, with the other colonies and states following suit, officials enacted laws to specify that slave status followed the condition of the mother. This continued right up to the eve of the Civil War in 1861 where the enslaved were still bought and sold on the open market. And so, until the signing of the Emancipation Proclamation by Abraham Lincoln in 1863, to be black in America was synonymous with a separate and unequal status. The American Civil War was fought to settle the question as to whether blacks should continue to be separate and unequal or whether the United States of America would finally be united – united in its commitment to the notion of justice and equality put forth in the Declaration of the Independence. The simple fact is that the North won the war, and in winning it, the North preserved the union. The Confederate statues, therefore, represent a step backwards – a symbol of what the United States once was – not what it is now. Today, the nation is experiencing what some call a civil war over statues. The only way to avert this new civil war – in some ways a symbolic one over the outcome of the original Civil War – is to have dialogue. And after dialogue, actions must follow. It could be that protesters who toppled Silent Sam acted out of a sense that dialogue had reached a standstill after years of debate. Communities may decide to take the statues down or replace them with monuments that honor abolitionists like Harriet Tubman, Frederick Douglass, William H. Seward or Thaddeus Stephens. They may also choose to keep the Confederate statues intact with a plaque that gives a more balanced view of the causes of the war. In this way, they would be used as a tool to teach about the Civil War – one of the bloodiest chapters in American history and one that none of us should want to repeat. The more difficult work when it comes to dismantling the legacy of slavery involves ending some of slavery’s byproducts, such as mass incarceration of black and brown bodies and systemic educational inequities for children of color. The hope is that those protesters will channel their zeal and apply it to these thorny and persistent problems. There is no easy fix. But if and when that fix does come, 100 years from now, America will be remembered not only for its technological advances – such as its computers, its robots or its driver-less cars – but for its commitment to human rights.